More than 50 years later, putting a man on the moon is still considered to be one of humanity's greatest achievements. But have you ever stared up at that glowing orb and thought to yourself You know, one moon is cool, but I just wish we had, like, two of them. No? Well, it looks like we may be getting another one anyway, thanks to scientists in China, who just announced plans to launch a huge fake moon into the sky that'll be eight times brighter than the real one. Now, before you ask yourself how exactly they plan to do this, you probably want to know why. The answer, in short, is to cut costs on street lighting. 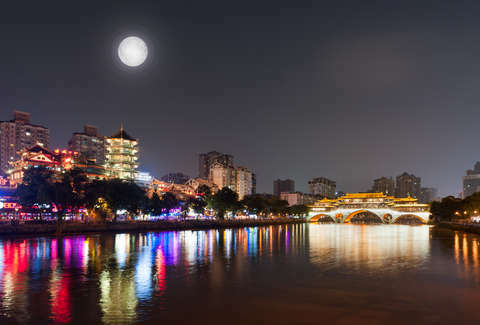 Seriously, the idea is that launching so-called "illumination satellites" over Chengdu, China will produce enough light at night to supplement or even replace street lamps, and thus reduce installation and electricity costs. Though to be clear, the fake moon wouldn't be lighting up the night sky all over China, as it'd only be able to illuminate a modest area of roughly six to 50 miles wide. Still, the light it would produce over that area would be eight times brighter than the light of the actual moon. As for how this would all work, the "moon" would actually be a giant mirror sent up into space on a satellite. Once there, it would unfurl to reveal its enormous highly reflective surface, and position itself specifically to reflect sunlight onto Chengdu during nighttime hours there. And while specific details about this grand plan are scarce, China reportedly hopes to have the moon brightening up the streets as soon as 2020, according to The People's Daily. Of course, not everyone is super pumped about it. Some have already voiced concern that blanketing such a large swath of land with artificial light at night would potentially ruin the ability to stargaze, and could seriously disrupt the wildlife in the area. However, as outlandish as this plan may seem, it's not the first time its been dreamed up as a way to deliver light in the dark. Back in 1999, scientists in Russia launched a similar device designed to brighten skies over Siberia, but it was a failure, per Smithsonian Magazine. Whether or not this will ever actually happen remains to be seen. Though one thing we can be sure of is that while our real moon may not be as bright as some people wish it were, it's still undeniably awesome.